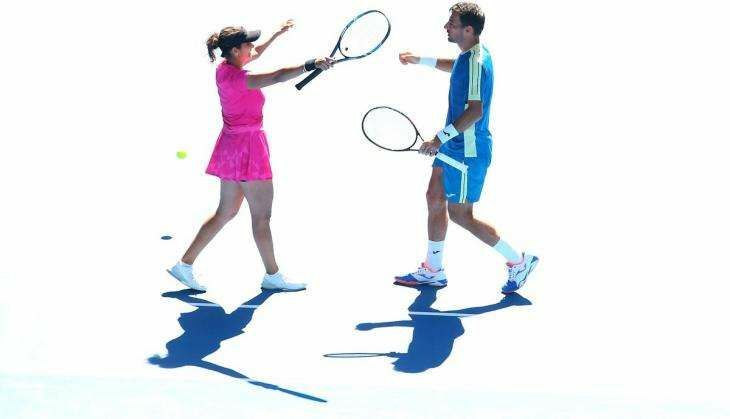 Sania Mirza will have to wait for her seventh Grand Slam trophy as the Indian and her Croatian partner Ivan Dodig lost the Australian Open mixed doubles final 2-6 4-6 to underdogs Abigail Spears and Juan Sebastian Cabal, here today. The second-seeded Indo-Croatian pair paid the price for the free-flowing unforced errors from the racquet of Dodig, who struggled with his serve and groundstrokes today. It is second runners-up finish for Sania and Dodig together after losing the final of the 2016 French Open to Leander Paes and Martina Hingis. Sania had won her first ever Grand Slam at the Australian Open only when she won the mixed doubles with compatriot Mahesh Bhupathi in 2009 and the last of her three women's doubles Major trophies also came here last year with Martina Hingis. After losing the first two points, Dodig served a double fault at 30-30 and then sent a forehand long to concede a break in the very first game of the match. Cabal and Spears though were in tremendous touch from the word go. Both were terrific from the back and at the net too. Sania was also broken in the third game. It was Cabal's brilliant volley pick up which he placed well beyond the two players to earn a break point. Spears smashed a backhand service return winner to take the break as the second seeds trailed 0-3. The American had an easy hold in the next to make it 4-0. The second seeds finally got on board when Dodig held the fifth game but they had already suffered the damage. Serving to stay in the opening set at 1-5, Sania saved a deciding a point to hold. Spears was now serving for the set and lost the first two points to be 0-30 and soon Dodig found a forehand winner to earn a breakpoint but could not convert. Sania hit a backhand wide on the deciding point to concede the first set. Dodig's serve was again under pressure as he faced a breakpoint and a deciding point in the first game of the second set but managed to save both. Cabal served a double fault at 40-30 to face a deciding point and the second seeds latched on to that to take a 2-0 lead as Spears hit a backhand long. Sania had an easy hold to make it 3-0 as the Indo-Croatian pair was back in the match. However, Sania was broken in the seventh game which allowed the rivals to neutralise the advantage. The Indian committed a double fault to be down by two breakpoints and Spears smashed one overhead volley to convert the first. Spears held without fuss and the two pairs were now locked 4-4. Dodig was never in his elements in today's match and he served two double faults, the second one coming on a breakpoint, to allow Cabal to serve out the championship.